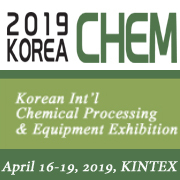 On behalf of organizer, we cordially invite you to KOREA CHEM 2019 which is Korea�s Representing Exhibition for Chemical Processing Industry to be held on April 16-19, 2019, KINTEX, KOREA. KOREA CHEM is showing the chemical processing & equipment technology for the pharmaceutical, bio, cosmetic, chemical industries. KOREA CHEM 2019 will be the best platform to initiate or expand your market share in Korea as well as Asia-Pacific region. Organized by Kyungyon Exhibition Corp. and IU NEWS(the publisher of a highly influential magazine in Korea), KOREA CHEM 2019 becomes the most important industrial event of chemical processing fields in Korea. With the participation of overseas & domestic exhibitors with world leading technologies and new products, it will be great opportunity for you to initiate or expand market share in Korea.